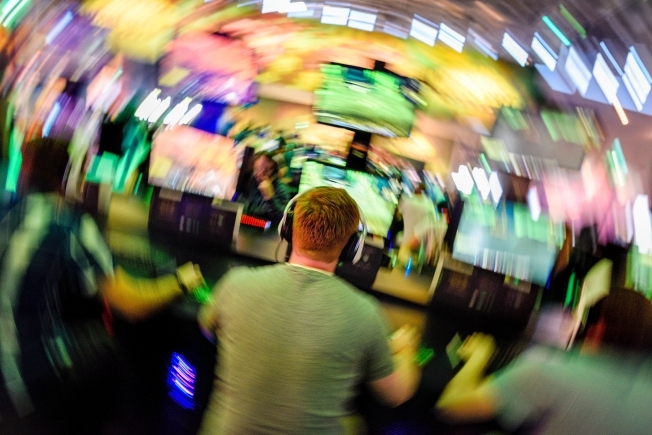 Visitors try out the massively multiplayer online role-playing game 'World Of Warcraft' at the Blizzard Entertainment stand at the Gamescom 2016 gaming trade fair during the media day on August 17, 2016 in Cologne, Germany. A Romanian man who was extradited to the United States to face federal charges of launching a cyber attack on the Irvine-based servers of the online role-playing game "World of Warcraft" was sentenced Monday to a year in federal prison. Calin Mateias, 38, of Bucharest, launched a distributed denial-of-service -- DDoS -- attack on Warcraft owners Blizzard Entertainment's servers in 2010 after the company provided access to the game to European players and Mateias became involved in disputes with other players. The DDoS attack flooded World of Warcraft's servers with a huge amount of traffic or requests, making the system inoperable for thousands of players. The cyber attack cost the company about $30,000 to repel, prosecutors said. "Angered by a player he regularly competed against, the defendant determined to defeat his WoW opponents by interrupting the game's server so they could not access the game," according to a defense sentencing memorandum. "His actions were motivated by a juvenile desire to win the game, and for others to lose it." Court documents show Mateias paid $30,000 in restitution to Blizzard Entertainment last month. Mateias pleaded guilty in downtown Los Angeles in February to a single felony count of causing intentional damage to a protected computer. Prosecutors recommended a 10-month prison sentence, while the defense unsuccessfully argued that the judge should immediately release Mateias -- who has spent the past six months in a federal lockup -- so he may return to his native Romania without delay.